Contemporary martial arts such as judo, aikido and karate-do seem very different. However, if you look for those things that are held in common you might be surprised by their many similarities. Let's look at some of the techniques taught today in a basic judo or jujutsu class. The new white belt is taught break falls, basic throws, and rudimentary ground fighting. As these skills become more developed, advanced techniques are introduced into the curriculum. With good instruction and some determined practice the student can reach a substantial degree of proficiency in his or her art. In most jujutsu systems punching and kicking is taught as part of the system's responses to various attacks or grabs. In judo, punching and kicking skills, however, are considered ancillary to the primary art. And while these techniques are a natural complement to throwing, joint locks, and grappling skills, today they are only taught to the most senior students. This was not always the case. 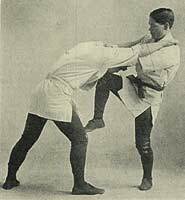 The 1924 book, "The Complete Kano Jui-Jitsu," did illustrate a variety of knee strikes, foot kicks and head pushes or strikes. But, as judo became more sports oriented, these techniques were no longer taught to most students. In other arts such as karate, kempo, or tae kwon do, the foundation skills consist mainly of punching, kicking, and blocks. As in the example above, when the student advances in skill and ability, advanced techniques that are representative of judo or jujutsu may be incorporated into the training curriculum -- throws, takedowns, arm bars and other joint manipulations. These same techniques are also found within the more advanced kata. 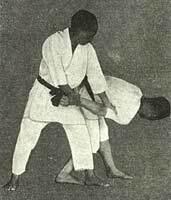 In Gichen Funakoshi's early 20th century karate books, for example, photos illustrate not only a variety of throws similar to those in judo, but jujutsu type joint techniques as well. In aikido too, striking techniques were originally considered a critical element to help set up many techniques by distracting or momentarily stunning an opponent. In fact, aikido's founder, Morihei Useshiba, is credited with saying that striking is a critical part of setting up many techniques. In the 1933 first published account of aikido, "Budo Training In Aikido," there are many illustrations of these initial strikes (see first photo in this article). In later years, however, Ueshiba tended to stress movement and the flow of technique, especially in his films, and in recent years the initial striking aspect of the art disappeared from the curriculum of many schools. As you may have noticed similar techniques are often taught as basic techniques in one system and advanced techniques in the second. It is a matter of the priority that each martial art puts on the techniques that determines at which point they are introduced. Each art has its own strategy of combat with different emphasis and priorities -- striking and kicking, throwing, grappling, joint manipulations, etc. Judo, jujutsu and aikido tend to deal with attacks at a grappling or close range. Arts such as karate will best handle attacks from a medium range. Tae Kwon Do, which is known for its kicking techniques, deals best with the longer range attacks. Of course each art can deal with attacks from other ranges, but it seems that they tend to emphasize particular ranges of techniques. Prior to the modern era warriors, such as the samurai, needed to be well rounded in their combative techniques in order to survive in battle. Thus, they were skilled in the use of various weapons and un-armed combative techniques. Today many martial arts do not train with combat effectiveness in mind. Most teach with emphasis on sport, physical fitness, or mental development. There is, however, a strategic relationship between the various arts. At the basic level of any martial art that is being used in a life or death struggle, the intent and purpose of the art is the rapid destruction of the opponent, or in the case of aikido, the neutralization of the opponent. Remember we are not talking about the sporting or the character building aspect of martial arts. I am talking about martial arts that are being practiced as self-defense methods. Here, most martial arts seek to cause injury, or at least incapacitate, the attacker -- by breaking, knocking out (by a punch, kick or strike), choking, or throwing. While various arts, such as karate, judo, tae kwon do, jujutsu, silat, aikido, etc., each have their own strategies and priorities of techniques, each also shares deeper body of knowledge that bridges their art, style or country of origin. What is it? 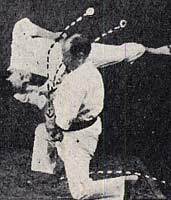 Pick up just about any older martial arts book in English published in the 20th century and you can flip to the back and find diagrams showing the vital points on the body. Many older texts in Chinese and Japanese dating from the 1600's and before also include these vital point charts. These charts may vary in the number of points shown, the locations shown, or the amount of information given about them, but the vital points shown were incorporated in some form in each art. These points represent places on the body that can be attacked and manipulated within that system to cause varying degrees of damage. Jujutsu thus made use of percussive techniques to incapacitate their opponents. Textbooks on judo from that time also describe the location and use of vital points in that art. An early work on Karate by Gichin Funakoshi has a chart of vital points and their reactions. Choi Hong Hi in his first work tae kwon do (1965) has a chart and list of points to attack. This list could go on and on, but to what purpose? Without question the use of vital points can be found to one degree or another in all martial arts whatever country of origin and is the thread that ties them together. Here is a crudely hand drawn vital point chart from the Bubushi, a once secret text owned by many early 20th Century Okinawa and Japanese karate masters including Gichen Funakoshi (founder of Shotokan karate), his teacher, Anko Itosu, Gogen Yamaguchi (founder of Japanese Goju ryu karate) and Kenwa Mabuni (founder of Shito ryu karate). 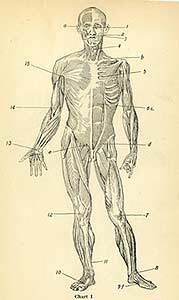 Compare this with a similar, modern anatomical rendition printed in the 1924 judo text, "The Complete Kano Jiu-Jitsu." Even though vital points have been shown in many older texts, however, there seems to be limited knowledge among the martial arts community today on their use. Their use has also been the subject of controversy. The reason is that traditionally their study was reserved for only the most trusted students of an instructor. As far back as 1915 Yokoyama, Oshima, and Horiguchi stated in their book Judo (1915) that the use of striking vital points were considered secret techniques, something to be keep away from students. Moreover this knowledge was never taught to the many foreign students who first studied various arts in Japan, Okinawa and elsewhere overseas following W.W.II. They returned home to teach their arts as they had learned them. Also, with the emergence of various martial arts as a sport, the combative nature of such arts as judo and karate has been relegated to a secondary position. In aikido and some karate systems emphasis has been on mental, spiritual and physical training. Thus, the unique knowledge of vital points and how to strike them has been neglected, or forgotten. In most karate, kempo or tae kwon do classes, for example, if strikes are indicated, students are instructed only in the most general of terms -- hit the face, or side of the head, or neck. No specific information about exactly where to hit and from what angle is given. In similar fashion all too many aikido students neglect an initial atemi or strike as part of their techniques. They are also not aware of how vital points can be used as part of their standard techniques to maximize their effectiveness. And in judo only the most advanced judo students are taught knowledge about vital points and how to use them while performing techniques, or where to aim if punching or kicking. The result is that teachers in many arts have never been trained in the use of vital points and do not have the skill or knowledge to teach that portion of the art to their students. It has taken only one or two generations of teachers for this unique information to be cleansed from the curriculum of most arts and schools. Today we are seeing renewed interest in this esoteric aspect of the martial arts. All over the world students are researching their arts, studying anatomy, neurology and Chinese acupuncture points, theory of energy flow, and seeking out older, knowledgeable teachers in order to rediscover this knowledge. 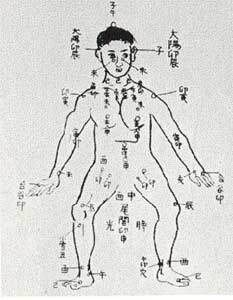 I would like to make an observation: all of the martial arts recorded the vital points of the body to attack. Each martial art, and/or styles within various arts, place varying degrees of emphasis on vital point techniques as well as various methods of utilizing these points. I find it very interesting that the use of vital points was considered so important that it is incorporated into every system of martial arts. To me this indicates how significant these techniques are to the martial arts, and how much respect they must command. Thus, I believe we should re-incorporate knowledge of vital points back into the study of various arts and systems to preserve this unique aspect of the martial arts. Rick Clark specializes in the study of vital point applications within traditional martial art techniques and teaches vital points seminars throughout the world. He has published numerous articles and books on the subject and has just published "Pressure Point Fighting: A guide To The Secret Heart Of Asian Martial Arts," published by Tuttle. He can be contacted at 3099 E. Dallas Rd., Terre Haute IN, 47802, or via e-mail at rick.aodenkou@worldnet.att.net.